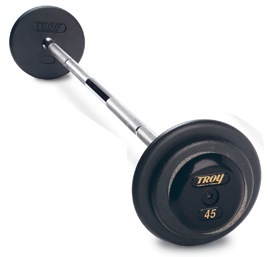 Troy Pro Style Straight Barbells with black end caps - Set 120-130lbs - are quality engineered and built to last. These commercial pro style fixed barbells are pre-assembled to ensure that all TROY products meet the standards required in heavy used commercial applications. These encased barbells are Troy's top of the line and offer the highest quality available today! Large easy to read numbers on each of the barbell allow for easy weight selection. All of our pro style straight bars use solid steel bolt design; bigger, longer and stronger than the competition. These bars feature special deep set knurling for functional performance and our top of the line TROY high grade gray or black plates. The Troy Pro Style Straight Black Barbells - Set 120-130lbs - set is a high quality, commercial grade barbell set designed for any heavy use setting. The knurled grips provide a good surface for a secure hold that is safe and feels good in the hand. Barbells are great for developing definition and muscle mass. This 120 to 130lb set comes with one barbell in 10lb increments. The barbell is very simple tool, so it is easy to learn the basic lifts quickly. With proper coaching, anyone without any debilitating pre-conditions can learn most barbell exercises in under an hour. The olympic lifts may be an exception for some, but I was taught each one in about an hour’s time. Another advantage of the barbell is that unlimited progression is possible because you can always add more weight to the bar. Of course, every lifter has their own genetically pre-determined maxes that they can handle. So, in theory, one could reach a point in their training where further progression is impossible. Being able to add more weight easily makes progressing with this tool very simple. Order your Troy Pro Style Straight Black Barbells Set 120-130lbs from FitnessZone.com today!